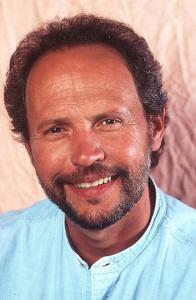 Billy Crystal's father owned a record shop, and his uncle was CEO at Commodore Records and later Decca. Billie Holiday was Crystal's babysitter on several occasions. Louis Armstrong once stopped by, and as Crystal tells it, his grandmother asked Armstrong: "Louis", she said, "have you ever tried just clearing your throat, just coughing it up?" In high school Crystal was a top shortstop, and he attended Marshall University on a baseball scholarship. Then the school discontinued its baseball program, and he transferred to NYU, where he majored in film and started doing stand-up. On the sitcom Soap, Crystal played Jodie Dallas, the first recurring gay character on American TV. It was quite controversial for 1977 -- right-wingers were offended that a "pervert" was presented on TV at all, and many gay/lesbian activists were angry that Crystal's performance played into gay stereotypes. Crystal responded by toning down the stereotypical behavior, making the character something most activists came to consider a positive portrayal. In 1975, he was scheduled to appear as a guest on the very first Saturday Night Live, but backed out when told his stand-up segment would have to be trimmed for time. He hosted the show twice during the 1983-84 season, then joined the regular cast for 1984-85. His Fernando Lamas "You look mahvelous" impression was his most popular schtick on the show, but he left SNL after just one season. He was a major movie star for a few years, starring in When Harry Met Sally with Meg Ryan and City Slickers with Jack Palance. Then came several turkeys like Father's Day with Robin Williams and My Giant with Transylvanian beanpole Gheorghe Muresan. Crystal rebounded in Analyze This with Robert De Niro and America's Sweethearts with Julia Roberts. He is a mainstay of the annual "Comic Relief" fundraisers, and has been a frequent host of the Oscars telecast. Crystal remains a big baseball fan, and he was a recurring if somewhat tedious talking head in Ken Burns' PBS documentary Baseball. He also directed a pretty good baseball movie for cable, 61*, about Roger Maris, Mickey Mantle, and the 1961 Yankees. Jerry Roberts. Encyclopedia of Television Film Directors (2009). Hollywood Walk of Fame 6925 Hollywood Blvd. Mr. Saturday Night (12-Sep-1992) · Buddy Young, Jr.